I told Jack Gleeson I sometimes listened to philosophy lectures in the car. “Who are you into?” he asked. “Well, I’m getting through the Greeks, the Stoics,” I replied. “Oh, the basics,” he said. : ) Here’s my interview with this very bright and thoroughly nice young man, as published in the Sunday Mail. Come visit the LUV Comics stand at Supanova! Where Jack will be, probably with a longer queue than us. Being in TV show Game of Thrones is a bit like being a member of royalty: millions of loyal subjects and you get treated with reverence wherever you go. Jack Gleeson would know. 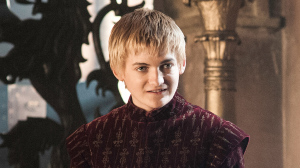 He plays the young king Joffrey in the popular HBO series. Gleeson has played Joffrey – the sadistically minded young king who commands fear if not respect – since the beginning of the series until he took his final bow this year. The young theatre lover, who grew up in Ireland, has been acting since the age of eight. But recently he surprised fans by announcing that after his character’s timely demise he would be hanging up his crown and sceptre and retiring from acting – at least for a while. Instead, he’ll remain on home turf in Dublin to finish his degree in philosophy with a view to potentially doing a Master’s. Is there a philosopher that resonates with him in terms of how to life a good life? The other thing that will keep Gleeson busy is Collapsing Horse, the theatre company he co-founded with three friends in 2010. Many were surprised that he decided to step away from fame and fortune and walk a different path. “They definitely do seem surprised and I’m not surprised that they’re surprised, because it’s obviously something that everyone dreams about, and it’s what I dreamt about. One of my big aspirations as a kid growing up, and even as an adolescent, was to be a famous actor, and that was always my goal. For now it’s onwards and upwards for the young actor who is definitely playing against type. But his time on Game of Thrones will go down as an unforgettable experience. While their characters may always be at war, the clichés of the cast being one happy family are indeed true, says Gleeson. Conleth Hill and Peter Dinklage are the jokers in the family, he says. Gleeson can be proud of taking the character of Joffrey to new levels. While he may the one that everyone loves to hate, surprisingly some fans come up to him who are pro Joffrey. This entry was posted in Geeks, Journalism, Life, Television. Bookmark the permalink.